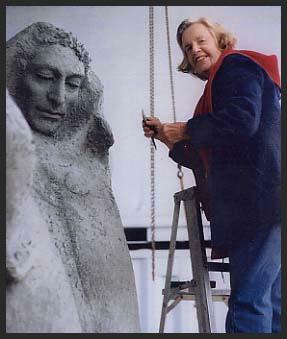 Harriet at work in 1999 on her large St. Francis of Assisi sculpture. Harriet G. Moore is a renown artist who resided in the San Francisco Bay Area. Her media included bronze, terracotta, wood, marble, as well as drawings and prints. She passed away on August 2, 2018, just two months shy of the proud age of 98. For several decades, her major oeuvre had been an interpretation of Dante’s Divine Comedy in paintings and sculptures as exhibited in NYC as well as at San Francisco’s Grace Cathedral, Fort Mason, Vorpal Gallery, and the Shrine of Saint Francis. 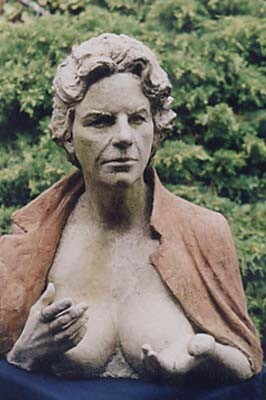 View a more comprehensive listing of her life's work, including art sold. Website by Tom Froehlich. Copyright 2018. All rights reserved. Need a website to promote your art, nonprofit or business?